It’s no secret that, statistically speaking, National Football League head coaches should go for it on fourth down more often than they do. The odds have been calculated lots of times, and fans, sports radio hosts and columnists love to point to them when they think a coach made the wrong decision. But overly broad probabilities and Monday-morning quarterbacking are for amateurs thanks to a data-analysis tool from the New York Times. The paper has created the Fourth Down Bot — a system that analyzes every fourth-down call from every NFL game against years of data involving the same down and distance, and then shares its verdict on each call online, in real time. So that’s what caused the Packers to get blown out. 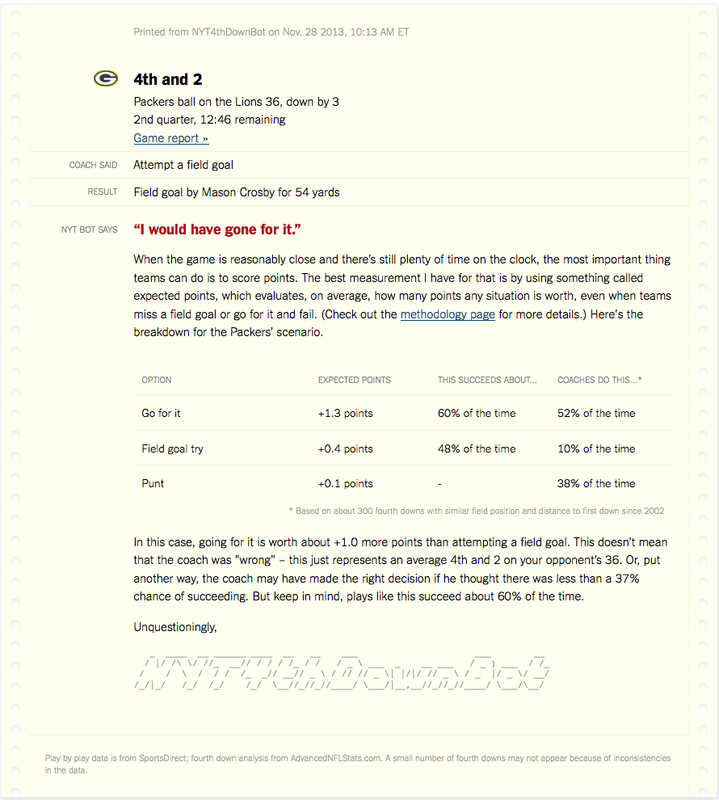 As of the most-recent Monday Night Football game on Dec. 2, the Fourth Down Bot (whose feed is presumably manned by one of its co-creators, Brian Burke of Advanced NFL Statistics or New York Times Graphics Editor Kevin Quealy) took to Twitter and occasionally chimed in on calls there, as well. What’s so cool about the bot’s verdicts is that they’re driven by a pretty intelligent model that’s based on expected points rather than just odds of conversion. Burke and Quealy break down the math in this post, but the gist is that the decision to go for it, punt or kick a field goal needs to take in a variety of factors, such as the opposing team’s field position if you fail and the likelihood they’ll score as a result the decision. Late in the game, the bot is set to base its decisions around the maximizing the chances of winning rather than just getting the most points. Of course, they note, there are plenty of complicating factors that make the bot far from perfect in its assessment — weather conditions, relative strength of the teams and a dearth of data about the new NFL overtime format among them. As we’ll discuss in great detail at our Structure Data conference in March, big data has forced corporate executives, from CEOs down to business managers, to rethink how they make decisions and build products. It has already had a major impact in the management ranks of professional sports teams, where advanced analytics play a big role in deciding who’s on the rosters. Now, perhaps, it can finally crack the toughest eggs of all — NFL coaches and their gut feelings that usually tell them to do the prudent thing while millions of people are screaming “Go for it” at their TVs. With this level of scrutiny and a job requirement to win at all costs, maybe listening to the data a little bit isn’t such a bad idea. Honestly, the computer says to “go for it” on 4th and 2 on your own 10 yard line! The bot clearly doesn’t have a multi-million dollar job to lose…. There is a High School that NEVER punt, ALWAYS goes for it on 4th down. PS: I believe they are multiple conference champions, and if I’m not mistaken have won several state titles. Any NFL Coach listening? That’s exactly what the graph on the left shows, and the creators cited Romer’s paper in their post.